Blending carrier oils allows you to make the lotion, cream, bath oil, facial cleanser or soap that best meets your skin's needs. If you plan to sell your creations, you'll soon develop your own proprietary formula of carrier oils, perhaps with the addition of essential oils and herbal extractions. However you plan to use your skin-care formulas, they all start with the right blend of carrier oils. Chosen wisely, these blends contain a balanced mix of highly moisturizing, semi-drying and nondrying oils, with the additional healing properties you seek. Consider the list of nondrying oils: jojoba, avocado, shea butter, wheat germ, cocoa butter, coconut oil, flaxseed, olive, palm, almond and peanut. These work well for damaged, dry and mature skin. Study the semi-drying oils: sunflower, sesame, corn and cottonseed. These are neutral, scentless oils which blend well with others. Choose from among the drying oils: grapeseed, apricot, soybean, tung and the nut-based oils. While these liquids work well for oily skins, they often need to be used in combination with a nondrying or semi-drying oil to avoid a parched-skin effect. Purchase your chosen oils at a supermarket or health food store. Buy small amounts when starting out. 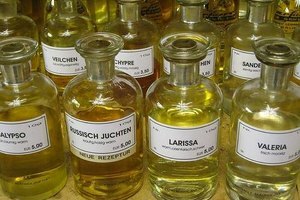 Look for labels indicating that the carrier oils are unrefined and cold-pressed or expeller-pressed. This indicates a higher nutritive content in the oils than those which have been exposed to heat or extracted with chemicals. Clean and dry a jar which can hold at least 8 ounces of liquid. For a starter blend, use 2 ounces each of three or four kinds of oil, with a maximum of six. Pour the first carrier oil into a liquid measuring cup until it reaches the 2-ounce mark. Add 2 ounces of the second oil to the measuring cup, bringing the total liquid amount to 4 ounces. Continue with your additional oils, raising the liquid level by 2 ounces each time. Pour the carrier oils into your clean jar. If using essential oils, add them now. Use 15 to 30 drops essential oil for every ounce of carrier oil for a body oil formula, and five drops per ounce for a facial blend. Cap the jar securely and shake vigorously to blend your carrier and essential oil blend. Make a label that states when you made the blend, what it contains and how much of each ingredient it contains. This will help you make any adjustments in the future. Store your blend in a cool, dry place. If possible, keep it in the refrigerator. Remember that the oils and butters do more than simply balance skin moisture. Study the nutritive properties of each and decide what blends best serve your needs. Wheat germ, for example, contains large amounts of vitamin E, but it is too concentrated to use on its own. Canola oil, on the other hand, possesses a nice, light quality but few nutrients. 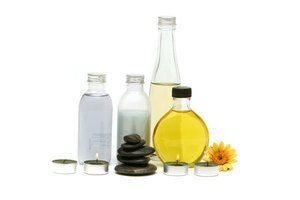 For liquid body and bath oils, choose only the liquid carrier oils. Creams, lotions and salves, however, can contain some of the solid fats---shea butter, cocoa butter and coconut oil---which must be melted gently on the stove, blended with the liquid carrier oils, and thickened with beeswax. Carrier oils can be infused with fresh or dried herbs, either individually or after they have been blended. Herbal-infused oils contain the healing characteristics of both the carrier oils and the herbs.